With a little knowledge and practice, testing for diabetes at home can become second nature. Whether you are here to learn about testing for yourself or someone you care about, we will walk through the difference between Type 1 and Type 2 diabetes, possible complications, the materials you need, and blood sugar testing. If you want a general overview of diabetes, see Diabetes: Symptoms, Types, Testing. Type 1 diabetes usually occurs in early childhood. Adults diagnosed with diabetes later in life almost always develop Type 2 diabetes. While the first is often genetic, Type 2 diabetes is a preventable chronic disease. Research from the European Commission shows there has been an explosive growth of the number of individuals with diabetes. The number of individuals with diabetes is also likely to double in the next 20 years. Shockingly, many people with diabetes are undiagnosed. Diabetes occurs when the hormone insulin fails to adequately absorb sugar, resulting in high levels of blood sugar, or a high glucose level. Treatment for both types involves insulin treatments, though Type 2 may also require a healthy and active lifestyle which includes eating right, choosing a well-balanced diet of nutritious foods and avoiding junk food. Short-term complications that arise from diabetes include dehydration, fatigue, lethargy, and nausea. 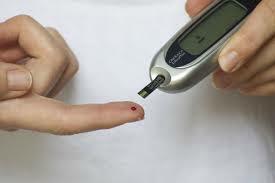 Longer term complications that stem from diabetes can often be seen as whole body system failures: heart disease, kidney failure, nerve damage, extremity damage leading to possible amputation, and eye problems like glaucoma. Testing for diabetes is essentially blood sugar testing to determine if your glucose level is within limitations in certain situations. You will need a glucometer and glucose strips to test your glucose level. Depending on your circumstances, these may or may not be provided by your doctor. If they are not provided for you, they can often be purchased relatively inexpensively at your local chemist. The glucose strip, sold separately, is a paper-like insert for the glucometer. The testing strip will collect your blood and feed the information to the glucometer. A new strip should be used every time you test your blood sugar levels. The glucometer will test the sample and provide feedback about your blood sugar level in terms of mmol/L. Although the process is relatively straightforward, it can be nerve-wracking the first few times you perform the test for yourself or for someone you care about. To mitigate your concerns, we will explore each of these steps in detail below. Because you will be working with blood, it is best to choose an area that is clean, well-lighted, and free of distractions. What area should you choose? For some, a clean kitchen table or counter might work best. For others, a well-lit room might provide distraction-free privacy. In a busy or loud household, a bathroom might be the best place to set up a calm and clean environment. The most convenient areas will be quiet, easy to clean and have access to a nearby sink. Next, lay out your glucometer and test strips so you can reach them easily. You should have also access to soap, water, a hand towel, a plastic bag, a band-aid, and a bin. Wash your hands thoroughly with soap and hot water. If you are performing the test on someone else, make sure you both wash your hands. This step is important to prevent infections in the site you will prick. This step might vary depending on the type of meter you have so you should follow the instructions that come with your meter and strips. Most meters have a clearly marked spot to insert the strip. Your glucose meter should have a sharp, pointed piece of metal, known as a lancet. Use this lancet to prick your finger. This step should provide only mild discomfort. As seen in the picture above, you should prick your index or pointer finger. To decrease any discomfort, you can prick a spot slightly to the right or left of the pad of your finger. A drop of blood should well up. Dip the strip into the drop of blood that appears when you prick your finger. The strip should soak up the needed amount of blood. Set your meter down in a clear area to wait for your result. Once you have set the meter down, your result should appear rather quickly. This may take anywhere from 5 to 30 seconds. In the meantime, wash your hands again with soap and water. Your doctor should have provided you a chart with the proper statistics. These numbers often vary on the type of diabetes, stage of diabetes, and how long it has been since a meal has been digested. Once you have identified your blood sugar level, remove the test strip. For safe clean-up, dispose of the bloodied strip in a plastic or water-resistant bag before placing it in the bin.